As war and violence continue to rage in Iraq and Syria, hundreds of thousands of refugees have fled their homeland to find security, regardless of what the future may hold. At the same time, many politicians and citizens have begun debating the country's moral and political responsibility when it comes to assisting those in need and defending the country's borders. "The majority of these cases have been Iraqi refugees. So far, we've only settled two Syrian families," Hattar told The Michigan Catholic, newspaper of the Detroit Archdiocese. There are more than 150,000 Chaldeans in metropolitan Detroit—the largest community in the country—and the area is home to the largest Arab population in the U.S. per capita. "The state of Michigan resettles an average of 6 percent of the refugees coming into the U.S.," Hattar said. "This is in part because of our demographics, but also because have so many welcoming communities with Detroit, Washtenaw County and Grand Rapids. We're one of the top five states in refugee resettlement." "That's never going to happen," Hattar said. "What the Christian community needs to keep in mind is whatever you advocate nationally that is against accepting Muslim refugees ultimately affects both Muslim and Christian refugees regardless because the federal government will not distinguish in their security process." Hattar said Catholic Charities has been in contact with Gov. Rick Snyder's administration regarding the Michigan's refugee policy. She said the state continues to accept refugees while the governor discerns whether to move forward with a proposed expansion of the program. "The governor's administration has been very interested in making Michigan a welcoming place," Hattar said. "His administration established the Office of New Americans, working on issues of integration, making sure refugees are successful when they arrive. "He established a task force to look at how we work on different issues regarding refugees and what we can do to increase the number of refugees in collaboration with the federal government. His intention is to put the plan to increase the number of refugees coming in on hold until he gets written confirmation from the federal government about the security process." 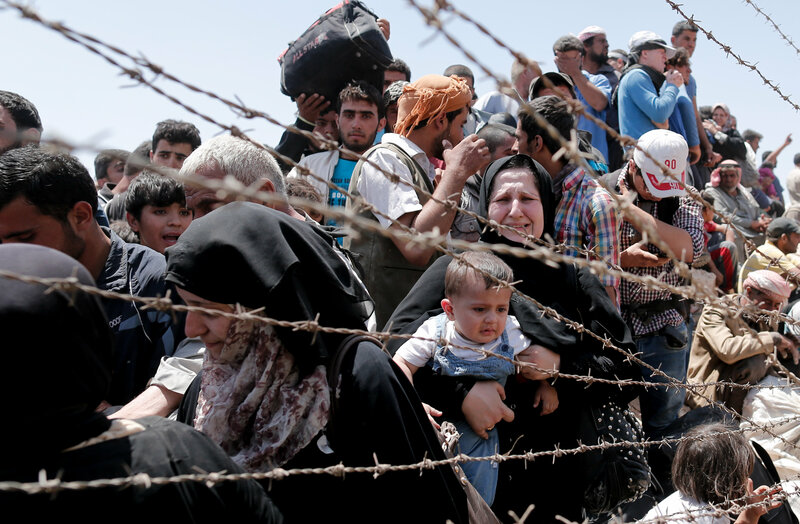 For now, the agency has resettled 294 out of a projected 650 refugees for fiscal year 2015. The agency asked the U.S. Conference of Catholic Bishops' Migration and Refugee Services program to resettle 850 refugees. "Our goal is to work with every individual refugee to get them to the point of self-sufficiency," Hattar said. "We consider what living preferences they might have, and if they are people of the same culture in the area. But we do promote diversity, because we don't want to create 'refugee communities' that would not be economically viable and would not set people up for success." "I would encourage all Catholics to review Catholic social teaching, read the many verses of the Bible concerning people on the run and Jesus calling on us to help a stranger. Contact your politicians, educate yourself," Hattar said. "For those who want to do more, volunteer," she added. "We need people to mentor refugees as they transition into life in America. Help us make our community a welcoming place and encourage them in the integration. But most of all, be open-minded."